Amazon EMR collects information from YARN applications on your cluster and keeps historical information for up to seven days after applications have completed. Detailed information is available for Spark applications. This feature enables you to view data that is otherwise available in the Spark History Server's web interface, but without having to establish a potentially complicated SSH tunnel for connecting to the cluster's master node. You can also identify and open relevant log files more easily than you would by connecting to the master node and searching the file structure. 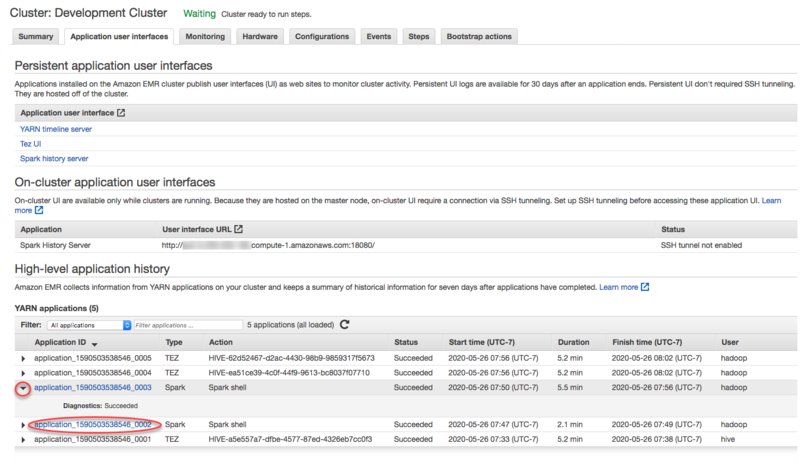 From the Clusters list, select the Name of a cluster and then select Application history. Each application is listed by Application ID. Expand a row to see basic diagnostic information for the application or select the Application ID to view additional details. For more information, see View Application History in the Amazon EMR Management Guide.